Once a year I have a physical, a checkup with my doctor, you know, and have a bunch of tests, and I go and I meet with the doctor, and um, you know, he talks about different things: "Oh, you got to work on this, you got to work on that." And then he, he sends me in the mail like a letter like, "These are the things I want you to work on this year." And um . . . You know from time to time, I think we also need the same thing, like spiritually, you know . . . to ask ourselves, "Am I spiritually fit, am I spiritually healthy?" You know, and also we need a plan to increase our spiritual health. And I think it's possible that a great many people have never in their lives had a plan to get spiritually healthy, and of course that’s where we’re leading, with this whole reflection on resisting happiness, with this whole journey we’re making together, that's where we’re leading. We need a plan to get spiritually healthy. And there, there may be many, many different components of that plan, and some of them might be daily components, and some of them might be annual components, and some of them might be just things you need to do once. But we need a plan. And there's no 1 plan that I can print out and say, "OK this is for everyone, this is the plan for everyone." And the plan we put together for you now might not necessarily be the plan for you next year or the year after that. Because there are seasons in our lives and there are different things that need attention and focus at different times in our lives. But what I'm absolutely convinced though, is, is we do need a plan, we all need a plan to grow spiritually and to develop, um . . . spiritual health. And so I think today is a good day to ask,"You know, am I spiritually fit?" "How healthy am I spiritually?" And, "What's gonna be my plan? Is it gonna be some daily prayer," you know, "Is it going to be some spiritual reading? Is it going to be visiting the lonely? Is it going to be getting more involved in my parish?" What's gonna be your plan? And, and to write it down. You know, the architect doesn't say, "OK, I've got it all in my head now let's start building." The architect, he writes it down, he draws the lines. And, and then the builder can take that and say, "OK we can start there and that there. . . " We need a plan. We need to write it down. It's possible that never in your life have you had such a plan. And that's actually good news. It's actually good news because it, it shows that incredible things are still possible. So take some time today, reflect back on some of the things we've talked about, sit down, write yourself a plan, not too long, not too short. Write yourself a plan, give it time. Is this a plan for a year, is it a plan for a month? But put yourself together a, a plan to get spiritually healthy, great things are about to happen as soon as you put that plan together. Great things are about to happen. What's your plan? 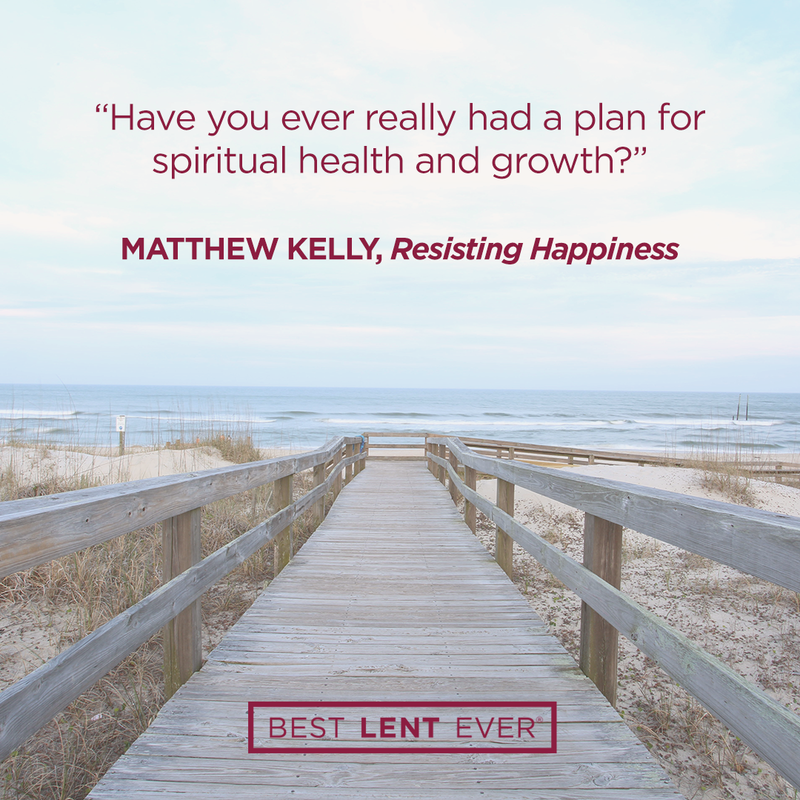 Have you ever really had a plan for spiritual health and growth? How are you going to grow spiritually over the next twelve months? Write down a plan. Jesus, I want to live the full life you have for me. Help me dedicate myself to spiritual growth. Today’s personal reflection features Dynamic Catholic team member Taylor Boyd. Taylor is our development project lead. She comes to us from Saginaw, Michigan. Taylor minored in Italian, won her first trophy at a spelling bee, and makes a delicious tofu curry. What is one thing that you could do to grow spiritually?